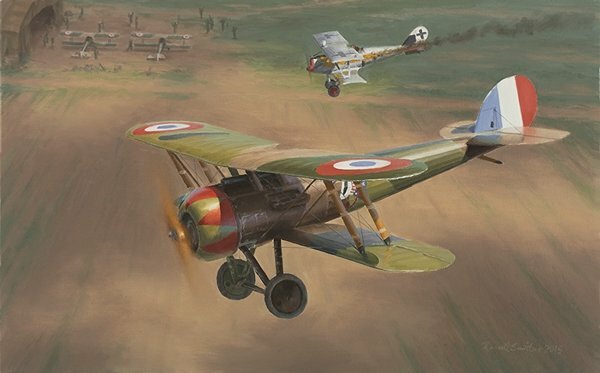 Home Field Advantage depicts Lt. Doug Campbell's victory on April 14, 1918 which would go down in history as the first official victory of the famed USAS 94 (Hat-In-The-Ring) Squadron. The action occurred right over the 94th's aerodrome at Gengoult and is very well documented. Campbell’s victim was a Pfalz DIII bearing the red and black tail stripes of Jasta 64w. Its interesting to note that on April 14 Campbell’s N28 still bore French cockades and tail stripes. The black fields had not yet been applied to the distinctive tulip pattern which his aircraft bore, nor had the number "10" been applied either. The machine did carry the Hat-In-The-Ring logo. The Pfalz crashed about 100 yards directly behind the 94th’s hangars. Printed on acid free stock with fade resistant inks, the print is signed by Russell Smith.